Lets talk about an affordable nourishing soap bar made of herbs from the product line of Moha. Product Info:Pamper your skin with this rich, luxurious Moha herbal soap. Enriched with oils of Neem, Basil and Aloe that nourish and moisturize the skin leaving it wonderfully soft, supple & infection free. It’s unique combination of plant extracts offer skin care with soothing and cleansing effect. Kumari – Humectant, Antioxidant, protects against UV induced stress. How to use: Wet the body and face, apply generously and rinse. 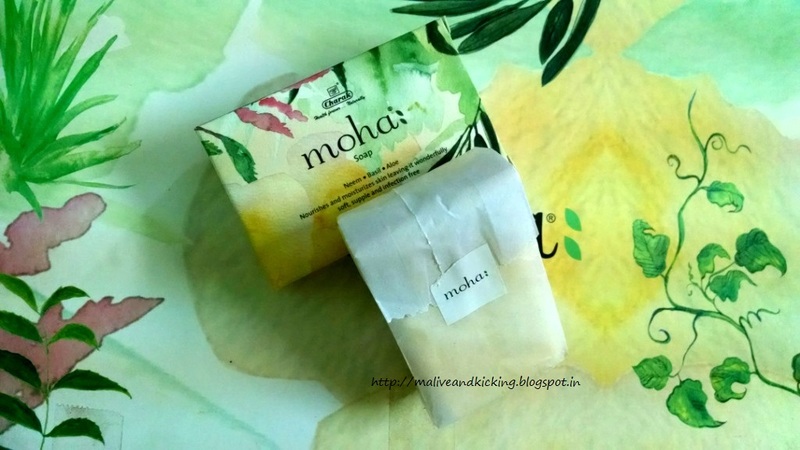 The soap is wrapped in a simple paper bag similar to made of butter paper that is sealed with a paper sticker labeled with Moha. There is an outer cardboard box that holds the soap bar. 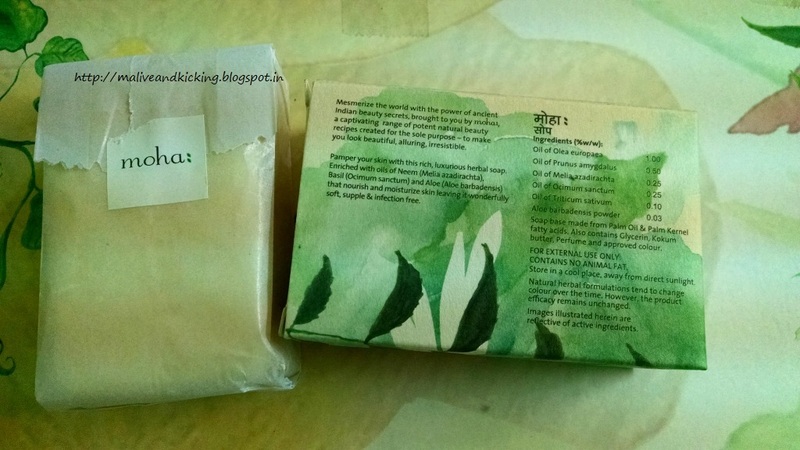 There is cute colorful leafy print on the box with all details about the product. 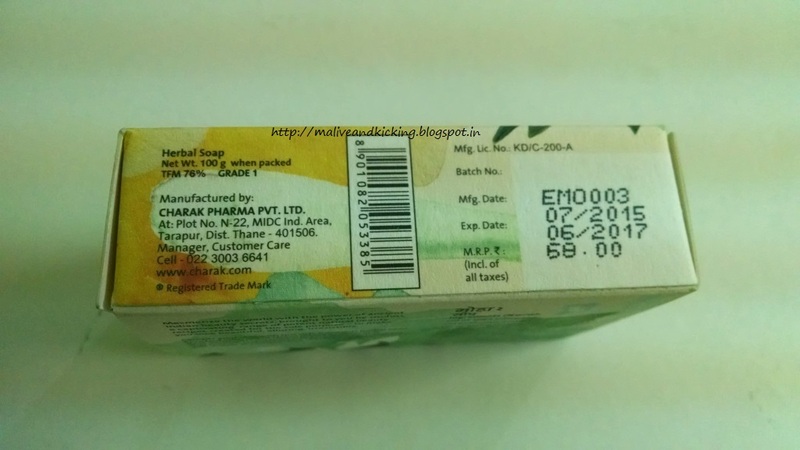 The soap bar is light yellow in color. The soap is a nice blend of herbs Neem, Basil and Aloe. The scent resembles more of basil. The warmth of the scent effectively helps me relieve from mental fatigue during shower. 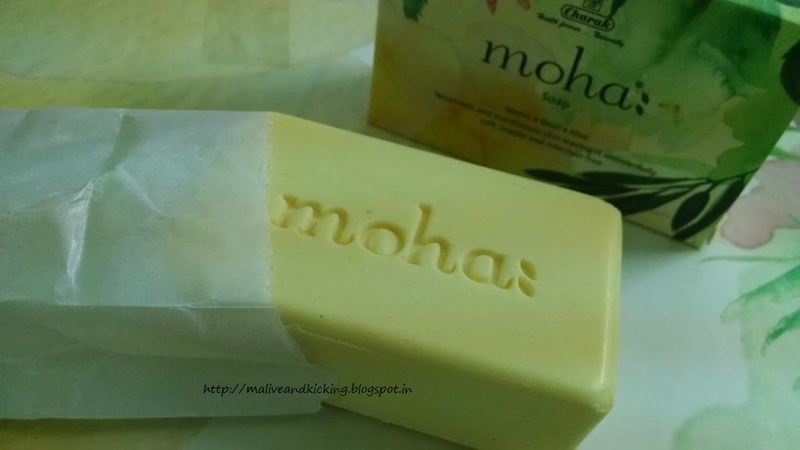 Neem oil used in the soap is said to have hydrating and anti-microbial properties. The oil is also used in dermatologic products for acne and other skin infections. So this soap can not only be used for personal sanitation, but is a good remedy for acne, blemishes, prickly heat, dermatitis and other skin ailments. The oil infusion of basil leaves helps to stimulate and refresh dull complexions if used in everyday bathing routine. Rich in vitamin E, this oil penetrates the skin to moisturize and soothe. Interestingly, the soap can be used on face as well (which I generally avoid with any other soap). Yet another herb, Kumari (Aloe) gel is useful for skin hydration and recommended for dry skin which makes the soap my recent favourite. It is assumed that Aloe Gel present in the soap helps reduce wrinkles on the face and improves hydration, so causes no drying or stretchy feel on facial skin. The soap lathers enough and doesn't melts excessively. Just take care to keep it dry in the soap dish after usage. Doesn't harm skin texture and skin tone. Strengthens the skin’s metabolic mechanisms. Delays wrinkle formation and other skin aging processes. 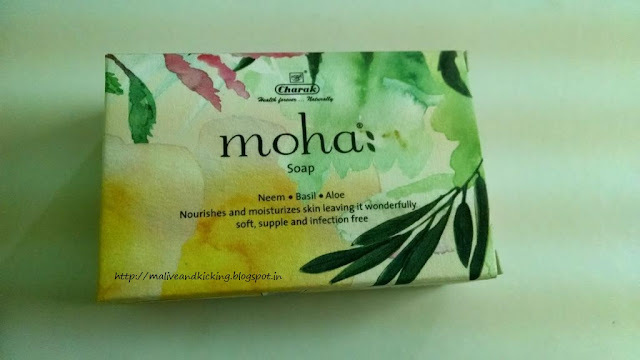 Moha Herbal Soap is a good moisturizing soap that is rich in multiple herbals ingredients. The soap is appropriate to be used by anyone for usual sanitation purposed or for special skin concerns. For this price, this soap is a must try..
Never heard about this brand. 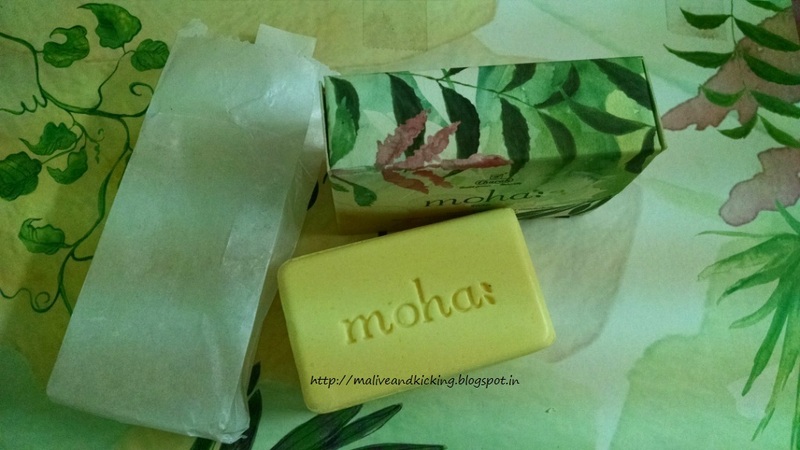 I am not a soap person but this one looks awesome :) Nice review. This sounds nice and affordable too. The packaging is undeniably amazing. Its good on skin too. Lovely mild fragrance and no overly foamy. Just the right thing I need as a soap.